Too much uric acid that flows through the bloodstream is one of the key factors in one developing gout. When this occurs uric acid crystals form in the joints and tissues of those who suffer from gout. All too often people make the mistake of consuming too much alcohol or caffeine to get through the day because these kinds of drinks contain purines. What purines do is that they break down into uric acid and interfere with uric and excretion. What is important to note is that the physical form of flaxseeds and flaxseed oil do have differences when comparing them. Flax protein in general treats and helps prevent heart disease while supporting the immune system. Flax can be used as a key ingredient into baked foods, muffins, dry pasta products and macaroni. The flax plant is an annual herb that the ancient Egyptians used as both edible food and medicine. To better understand the links between flaxseed and gout it is important to note the general health benefits a person can receive by consuming flaxseed or flaxseed oil. For starters flaxseed is an anti-inflammatory agent, as in it’s a reliable option for consumption to treat arthritis, even in the cases of rheumatoid arthritis, lupus and Raynaud’s phenomenon. There is a positive link between flaxseed and gout that gout sufferers can appreciate. Both flaxseeds and flaxseed oil are considered to be vegetable-based fats, which are the good kind of fats. Along with olives, avocados, coconut oil, olive oil and various fish oils, flaxseed and flax seed oil are rich in Omega-3 fatty acids, according to the University of Maryland Medical Center. Alpha-linoleic acid, or ALA, makes up 57% of the total fatty acids found in flaxseed oil. ALA happens to be one of three kinds of Omega-3 fatty acids. ALA is converted into the other Omega-3 fatty acids docosahexaeonic (DHA) eicosapentaenoic (EPA) when it’s consumed. Flaxseed oil contains more ALA than ground flaxseed. Flaxseed oil is low in saturated fatty acids at 9% while being fairly moderate in monosaturated fatty acids at 18%. In polyunsaturated fatty acids flaxseed oil is very rich at 73%. The flax plant has special chemicals called lignans which convert to plant estrogen in the digestive tract. Lignans are a key anti-inflammatory component in flaxseed, though they are usually lost in flaxseed oil during the pressing process. The only way for lignans to be absorbed by the body is that one consumes grounded flaxseed or the type bought as meal. Flaxseed is rich in both soluble and insoluble fiber, so whether or not the fiber type dissolves in water flaxseed is a rich fiber option. Insoluble fiber absorbs water and bulks up the digestive tract, remaining in the intestinal tract. Gout sufferers benefit from fibrous foods as they reduce the risk of developing constipation. Around 1/3 of uric acid is excreted through the bowel. Flaxseed and gout are more linked than what many may think, according to various scientific studies. One study conducted by Dr. Floyd Pacheco Jr., a podiatrist based in Albuquerque, New Mexico, and colleagues featured the comparison between flaxseed oil to soybean oil and to no supplementation at all. The amount of uric acid found in the group of rats that consumed flaxseed oil was 34% less than the group that took no supplements, and 44% less than the soybean oil group. Dr. Monika Styrczewska and a group of colleagues discovered in 2012 that a couple compounds of flaxseed share similarities to that of cannabidiol, or CBD. The UV spectra and the retention time in UPLC analysis are the similar compounds. This discovered compound, called a terpenoid, affects the gene expression in inflammatory processes in mice and humans and the CBD elements likely activate the cannabinoid receptor 2 (CB2) gene expression. Whole flaxseed, flaxseed oil and lignans were all put to the test in a meta-analysis on how much they could impact a person’s LDL cholesterol levels. A total of 28 studies were conducted from 1990 to 2008, and results included a reduction of total and LDL cholesterol by 0.08 and 0.10 mmol/L respectively. In 1952 German chemist Dr. Johanna Budwig was the senior expert for fats and pharmacuetical drugs for the central government. Budwig discovered that when they have been chemically treated the key qualities of unsaturated fats are destroyed. The field of electrons that the cell membranes, which is made up of 60 to 75 trillion cells, in the human body must have to properly function is destroyed by the commercial processing of fats. When electrons are destroyed fats become inactive. Budwig is famously known for establishing a protocol that can not only help treat gout, but also more severe conditions such as cancer. Budwig assisted many seriously ill patients get back to good health through a simple regimen involving a combination of flaxseed oil and cottage cheese. Budwig’s signature blend consists of 1 cup of organic cottage cheese, 2 to 5 tablespoons of flaxseed oil, 1 to 3 tablespoons of ground flaxseed, a pinch of cayenne pepper and enough water to make the substance soft. There are multiple ways to consume a sufficient amount of flaxseed, whether it be the grounded type or the oil. 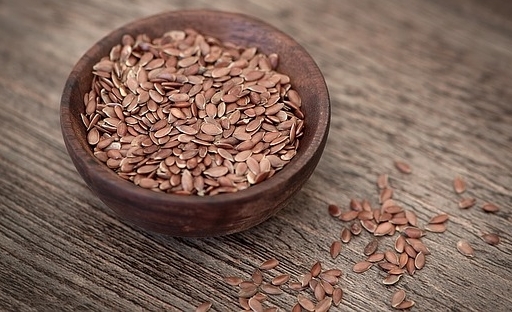 Here are some methods that have been proven to work for flaxseed consumption. When establishing a normal exercise routine many people often make the mistake of adding whey powder to their drinks. One well kept secret is that frequent consumption of whey actually leads to hindering conditions like gout. Instead replace the whey with ground flaxseed by stirring 1 tablespoon of flaxseed into drinks like smoothies. Alternatively you can add flaxseed into foods like oatmeal and cereal as well. If you happen to like pasta then you would be glad to know that 2 tablespoons of flaxseed oil would spruce up a ½ pound of cooked pasta. A good addition to the pasta would be various roasted vegetables that are coated with equal amounts of flaxseed and olive oils. Salads are the most ideal for the inclusion of flaxseed. Ground flaxseed can be used as a topping for salads, or you can mix 1 tablespoon of ground flaxseed into chicken, egg and tuna salads. If you like to add vinaigrettes to your salads you can mix 3 tablespoons of flaxseed oil along with 1 tablespoon of vinegar and 1 tablespoon of Dijon mustard. Last but not least flaxseed can be used in baking foods, and in most cases bread. There are various bread recipes that include ¼ cup of whole or ground flaxseed. In the event that you get tired of using the same old butter and oil products for baking, you can easily replace these ingredients with flaxseed oil. Both flaxseed and flaxseed oil are healthy to consume and it comes down to a balancing act in one’s uric acid levels. Regulating your digestive system and being able to take successful bathroom breaks end up fighting for your cause in treating gout. Flaxseed products are anti-inflammatory agents that can relieve pain in a person’s joints, and are certainly safe to add to any meals if they are capable of reversing the process of forming cancerous tumors in the body.